This top is light and airy. It is also very versatile, since you can dress it up or down depending on what you wear underneath. It has an Empire waist laced with a velvet ribbon and tied in the back. A matching ribbon supports and embellishes the neckline. 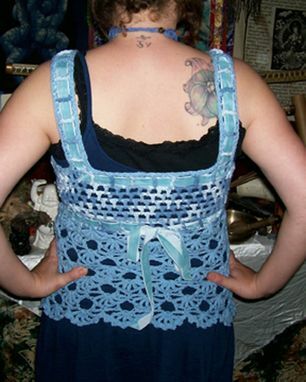 The bottom edge has scallops with picots and is hip-length. The back is low, about at bra level. 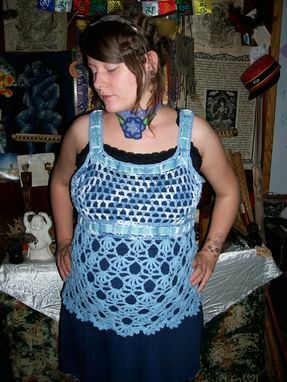 The body is crocheted out of cotton and the ribbon is a rayon/cotton blend. My pregnant friend is modeling it, but it looks just as fabulous on non-maternal tummies as well! Some of the cotton yarn is upcycled and the rest of the materials are new.